We made it home safely last night. Wow! 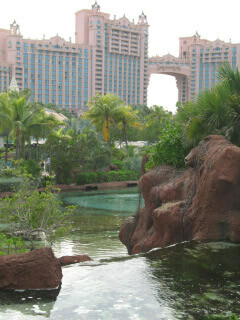 So much to see and do at Atlantis. 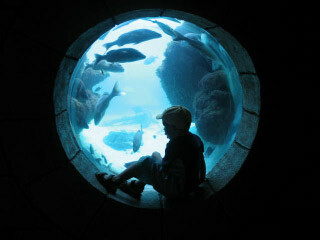 The architect, marine exhibits, shoppes, food, and activities kept us quite busy. We arrived on Thanksgiving and spent the day browsing until dinner time. We had Thanksgiving Dinner at the Cafe at the Great Wall of Water. With being our traveling day, we were exhausted and retired after dinner. 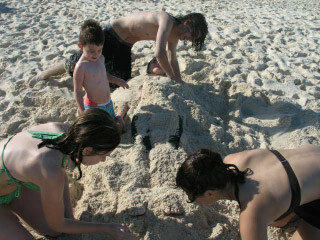 The following days, we spent enjoying all the waterslides, pools, beach, and food. 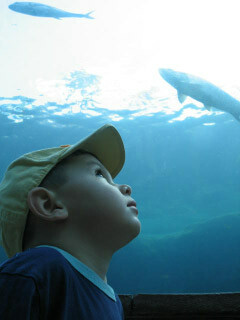 We interacted with the dolphins and got really upclose to these awesome mammals. Will be back to stamping tomorrow. I have to clean, wash clothes, and somehow fit decorating for the holidays into my busy schedule. 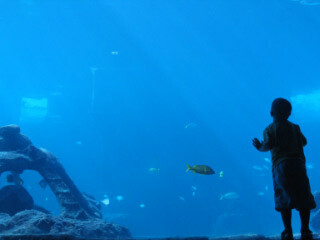 #53 Donna Baker Says: November 16, 2007 at 8:57 am I’m SO glad I found your blog last month! Your creations are out of this world bang-up awesome! Congrats on the hits and thanks for all the inspiration. Happy Thanksgiving everyone. I will return on Tuesday with the full report and pics of my trip. The news is out so I thought I’d share with you if you haven’t seen yet. Kim (MFT Lady) posted on her blog & SCS her new DT members. I am so excited to announce that I am on the My Favorite Things Design Team. I am so thrilled to be in a group of such very talented ladies. When I saw this sketch, I had to give it a try. It is a standard card 5-1/2″ x 8-1/4″ with Basic Black CS folded in half with 2″ cut off the upper front. Corner Rounded the upper corners. Dashing DSP to inside measures 4″ x 5-1/4″ with all four corners rounded. Added a 1/4″ x 4″ strip of the Dashing DSP to the top with 5 black brads equally spaced. The front of the card: I added a layer of Old Olive CS measuring 3-3/8″ x 4″ with bottom corners rounded. Added another 1/4″ x 4″ strip of the Dashing DSP with 2 black brads. Stamped sentiment to bottom right. The main image piece in order of layers: Basic Black CS 2-1/2″ x 3″ with top corners rounded; River Rock CS 2-1/2″ x 2-3/4″ & edges sponged with River Rock ink; hard to see in pic but another River Rock CS piece measuring 1/2″ x 2-3/4″ on top of larger river rock…placed to the bottom of this piece to create the depth and flooring & sponged with Old Olive ink; The chimney image and all the elements were stamped on Papertrey White CS with Stazon Jet Black ink and used Aqua-Painter to color in; Next layer is the Christmas tree stamped on Papertrey White, colored with aqua-painter and Old Olive ink, sponged edges with Old Olive ink, colored lights in with Real Red Stampin’ Write Marker, adhered to main image piece so it would overlap on top of chimney and hang off the edge; next is the festive christmas rug colored in with Real Red, Old Olive, and River Rock inks; finally, added all the gifts. Added a little sparkle to all the elements with a Gelly Roll metallic glitter pen (love this). 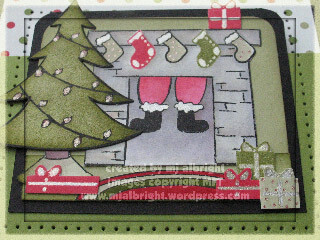 The ideas and possibilities for this Home for the Holidays stamp set are pretty much endless. I had so many thoughts, but went with a traditional look. Once I thought I was finished, I had to add the paper-piercing around the main image. This extends to the back part of the card, creating a box and making the eye go right to the main image. CARDSTOCK USED: Basic Black, River Rock, and Old Olive CS; Papertrey White; Dashing DSP. INKS USED: Stazon Jet Black; Old Olive, River Rock, Real Red, Chocolate Chip, Sahara Sand, Going Gray, and Creamy Caramel Classic Stampin’ Pads; Real Red and Old Olive Stampin’ Write Markers. ACCESSORIES USED: Vintage Brads Assortment; Gelly Roll Glitter Pen; Aqua-Painter; 3/16″ Corner Rounder Punch; Stampin’ Sponges; Paper-Piercing Tool. 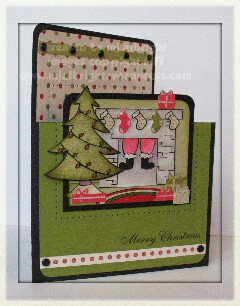 Here is another card using Beate’s wsc#28. I wanted to make a baby card for Charmaine who just had a baby boy this past week. After looking at all the other samples for this weekends sketch, I thought maybe I did my first samples wrong. So, here’s another take on the challenge with the stamped image in the circle on the sketch. 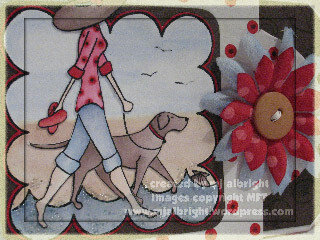 For this card, I used She’s Having a Baby stamp set from MFT. How simple and cute this turned out. And, gotta love Chocolate Chip with Soft Sky & Very Vanilla. The card base is 5-1/2″ x 8-1/2″ piece of Chocolate Chip CS folded in half. 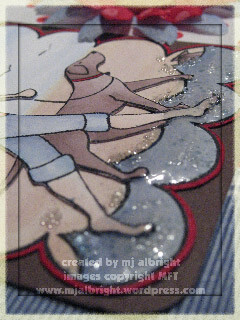 Next two layers are Blue Bayou CS 4″ x 5-1/4″ & Soft Sky Prints DSP 3-3/4″ x 5″ with Ticket Corner Punch to the corners. Sponged Chocolate Chip Ink to DSP edges. Added a piece of Twill Tape with Soft Sky Dbl-Stitched ribbon layered on top and tied in a knot. The teddy bear image was stamped on Very Vanilla CS with Stazon Jet Black ink and colored in with an Aqua-Painter and Chocolate Chip ink. 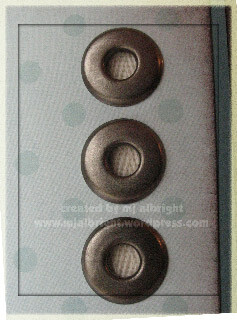 Punched image out with a 1-1/4″ Circle Punch. Adhered to a Blue Bayou CS circle punched with my 1-3/8″ Circle Punch. Scallop Punch to a piece of Chocolate Chip CS and punched holes to each scallop with my 1/16″ Circle Punch. 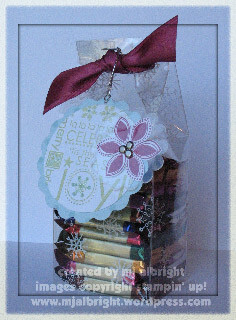 Adhere all pieces together and attach over ribbons with Stampin’ Dimensionals. Stamp “welcome baby” to bottom right of card. Next, for balance, I had to add something to the right upper side of the card. When all other ideas are used…turn to the wonderful Jumbo Eyelets…you can’t go wrong! 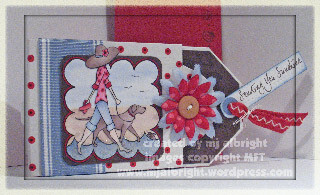 I wanted to carry the theme of using the twill tape over to this side of the card. I punched 3 holes and attached the Pewter Jumbo Eyelets with my Crop-A-Dile. Before adhering the two pieces of CS to the card base, I adhered a strip of Twill Tape to the back of these pieces, then attached to the base. So, your end result is seeing the twill in the holes of the eyelets. Just adds a soft touch….love it! INKS USED: Stazon Jet Black Ink; Chocolate Chip Classic Stampin’ Pad. ACCESSORIES USED: Pewter Jumbo Eyelets; Stampin’ Sponges; Crop-A-Dile Tool; Aqua-Painter; 1-1/4″, 1/16″, and 1-3/8″ Circle Punches; Scallop Punch; Twill Tape; Soft Sky Dbl-Stitched Ribbon. 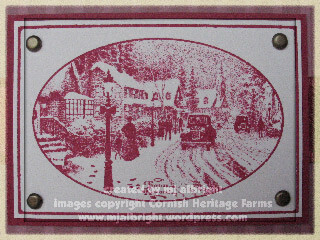 I first fell in love with TK stamps, from Cornish Heritage Farms, when I saw an image stamped in Purely Pomegranate on Lori Craig’s blog. You can see her card here. I haven’t even thought of attempting to color in this stamped image. I couldn’t replicate the original and I think it just wouldn’t look right…so go monochromatic and be safe right?? I wish I lived in this setting. It is so my style with the light posts, stone & brick houses with the beautiful windows, the church, and all the trees covered in snow. How picturesque. Okay, I’m back to reality with my Wisteria Lane type neighborhood and all the desperate housewives all over the place who know everything about everyone…LOL. 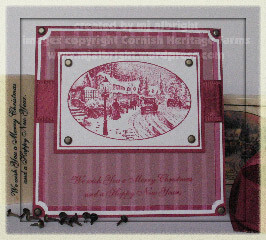 This card base is Purely Pomegranate CS measuring 4-1/4″ x 8-1/2″ folded in half. 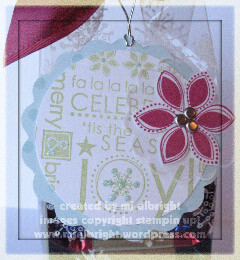 Layers are as follows: Whisper White CS 4-1/8″ square with Ticket Corner Punch to all 4 corners; Holiday Harmony DSP 4″ square with Ticket Corner Punch to all 4 corners; Vellum paper 3-3/4″ square with sentiment stamped to bottom middle in Purely Pomegranate ink. All three of these layers here adhered together, added a piece of Purely Pomegranate Satin Ribbon across, then adhered to the card base. Main image stamped on Whisper White CS measuring 2-3/16″ x 3-3/16″ (just an odd image size) matted on Purely Pomegranate CS 2-5/16″ x 3-5/16″. Added 4 brads from Vintage Brads Assortment and attached to card base. Added 4 more brads to the outer 4 corners of the card base. That’s it. This card took 10 minutes to make. This is a definite mass produce card for giving out this holiday season.